Anju Athopkam is a young woman whose zeal matches her ambitions. She lives ins Bishenpur Bazaar in Manipur. She is a weaver by profession and makes towels, the traditional Assamese ‘mekhelas’, sarees and bedsheets. 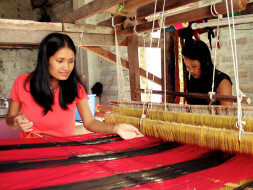 Not content with running a household, she decided to start her weaving enterprise a few years back. When that began to do well, she sought a loan from Milaap’s partner YVU Microfin and invested in wholesale raw material, and began to churn out bigger profits. This is the story of man enterprising women in Manipur and Assam who are coming forward to become independent and self-sustaining. Small towns in India are filled with young, hard-working dreamers. They make the best of the limited opportunities and resources available to them. Their success inspires more people around them to do something similar. YVU Microfin has been helping enterprising locals in Assam and Manipur kickstart small businesses by providing microcredit to them. Businesses like tailoring, fast food and tiffin shops, clothing businesses, weaving etc. Apart from making people self-sufficient, the loans help expand small businesses, thereby providing job opportunities for more locals as well.